While we’re planning to eat more healthy food, get fit and sleep more, spare a thought for the things you can do to improve electrical safety at home this year. 1. Check your smoke alarms once a month - it’s quick and easy to do. Effective smoke alarms could provide those valuable extra minutes to leave your house safely if there’s a fire. 2. Don’t buy a cheap phone charger when you need a replacement. The charity Electrical Safety First tested a number of non-branded or fake chargers and found that the majority could potentially give you a shock or cause a fire. 3. Don’t overload sockets by using multiple adapters or extension leads. Use just one extension lead per socket. Consider having additional sockets installed if you regularly rely on extension leads and adaptors. 4. Register electrical appliances with the manufacturers so that they can easily contact you if there’s a fault that needs fixing or a product recall. 5. 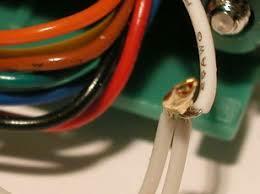 Check with vulnerable or elderly people you know, in case their home has old or damaged appliances or faulty wiring.